For homeowners, replacing roofs is often a part of the home maintenance process. Whether your roof has outlasted its time or you have sustained damage from inclement weather, there are certain things you should know before you start the process. 1. Be Prepared for Noise – Replacing roofs is not a project that is quiet, you will know when the roofers are at work because it will be noisy. Hammering, compressors, nail guns, saws, and other tools are needed to tear off a roof or put on a replacement. If this is not a good time for a lot of noise then you may want to wait for a better time if possible. 2. Expect Some Inconvenience – Very few home maintenance projects are convenient, but when you are having work done on your roof the inconvenience may be taken up a notch. Usually life cannot go on as normal because of the construction work, and it can be an inconvenience. The end result is worth all of the hassles though. 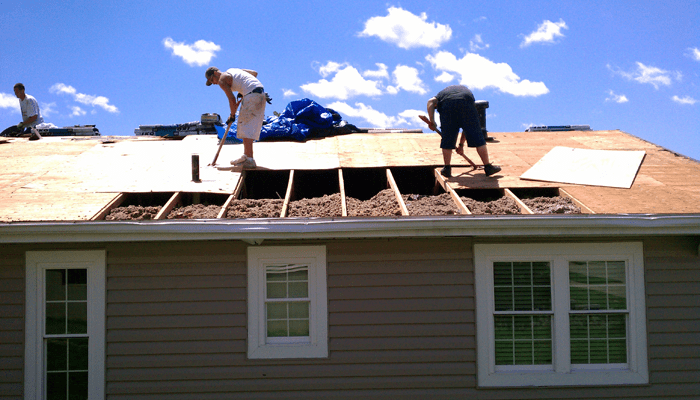 Tip: Generally, the roofing crew will need complete access to your driveway. Be sure to park your vehicles in the street so you aren’t blocked in your garage. 3. Think Carefully Before Taking This Step – Replacing roofs is not a step that should ever be taken lightly, only after a lot of thought and consideration. Think about why you want the work done and what you hope to gain from this project. The right decision can only be made after a lot of time and thought have been put into it. 4. Roof Replacement or Patch Job – Determine whether you actually need a new roof or if you just need some routine home maintenance on your existing roof. In some cases a patch job may be just as effective if you have a small leak or other minor issue, but there are other cases where this is not an option. Sometimes the damage or age of the roof mean that a full replacement is needed and minor repairs are not an option. From our article: Cedar Shake Repair or Replacement | Which is Best for Your Home? Read the whole article here. 5. Consider the Cost – Replacing roofs can be an expensive prospect, and you need to think about the cost before you jump in and forge ahead. In addition to the quoted price that you are given you need to be aware that hidden damage could be uncovered, and this can raise the price even further. 6. Materials to be Used – Before you decide to start replacing roofs as part of your home maintenance and repair strategy you need to look at the various materials that you have available from which to choose. You will need to decide which materials you want to use so that you can get accurate estimates from roofing companies. 7. Budget for this Project – You will need to make sure that you have budgeted appropriately if you plan on replacing roofs. Your budget should include an additional amount for any unexpected discoveries, so that any new problems can be repaired without delay without going over your set budget amount. 8. Ask for Referrals from Friends and Family – If you plan on replacing roofs in the near future then you need a list of qualified roofing contractors that you can compare and choose from. Ask friends, family members, and even co-workers for referrals if they have ever had roofing work done. 9. The Age of Your Roof – Home maintenance will help prolong the life of your roof when it is carefully followed, but the age of your roof may make a replacement necessary. Consider how old your roof is and the warranty offered on your current roofing materials before you decide on a complete replacement. 10. Tear Off or Shingle Over – One big consideration when it comes to replacing roofs is whether you will have the professionals tear off any existing material or shingle over it instead. The number of layers and the regulations in your area will help you determine which method is the best one in your individual case. 11. Current Roofing Material – Whether you have followed the recommended home maintenance schedule or not you need to think about your current roofing material when deciding if a replacement is necessary. Are you satisfied with the look and performance of the materials enough to use them on the new roof or do you want to change up? 12. Finding a Contractor You Can Trust – Before you can even begin to start replacing roofs you need to find a contractor that you can trust, and this means doing your homework, comparing roofing companies, and choosing a contractor who is reputable and trustworthy. What else should you consider before you start replacing roofs and why?